A Google engineer created the original chrometophone android app whilst on a plane. The app allows you to send the web page that you are viewing in your Chrome browser to the browser of you android powered device. 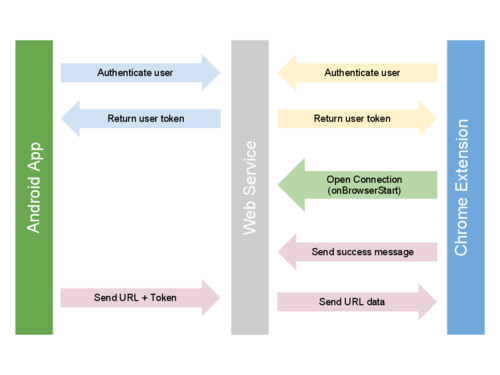 The services uses Cloud 2 Device Messaging (C2DM) partnered with an web service hosted on app engine to send messages directly to a users device. The user first has to register their device with the chrometophone service. This service works really well but currently doesn’t allow you to send the web page you are viewing on your phone back to the Chrome browser on your desktop. Unfortunately the C2DM service doesn’t allow you to send messages back to the browser (as far as I know). Therefore I propose using web sockets (with a long-polling fall back) to create a connection between the Chrome browser and the web server. An android app would then post a message to the web server (through the ‘share’ menu) which would be routed to the user’s Chrome browser. The user would need to authenticate the app using OAuth or similar service on both the mobile device and in Chrome. When chrome is opened an extension would establish a connection with the web server and wait for any messages (URLs) to display. This has the disadvantage that the browser must be open before posting the URL from the user’s device however at this point in time I do not have a solution to this problem (short of some native client running on the users machine). Below is a diagram of how the service would work. This is currently just an idea however I will try and get a prototype working this weekend. For now I am just mind-dumping the idea here. If you are interested in getting involved with the coding get in touch (@MattAntWest).